Dietary Supplement. Nature's Ultimate Lean Muscle Formula! No trans fatty acids. Burn fat! Don't store it! Zero lactose. Creatine GCC - Increased anabolic creatine output. » Micellar Proteins - Stimulate muscle synthesis. » LeanLipids - Designer fats promote leanness. » Growth Peptides - Boost nitrogen balance. » Complete A-B Caseins, Peptides and Lactalbumins - Trigger new growth. » Lactoferrin - Increase oxygen delivery. » MCTs, the predigested fatless fats, are more likely burned for muscle energy and heat than stored as fat. 20% of human milk and Muscle Milk lipids are MCTs. MCTs also promote positive nitrogen balance. Long-chain polyunsaturated fatty acids are also less likely to be stored as fat. We use special enzyme engineering to make these lipids even more functional, promoting anti-inflammatory effects and enhanced mineral retention. Recent research reveals calories with engineered lipids, taken before and during workouts, promote leanness. It is thought that these calories are used for workout energy, with less deposited as fat. So while Muscle Milk may contain slightly more fat than older ultra-carb products, our Lean-Lipids are designed to help you get leaner. Ingredients: EvoPro Our Custom Protein, Peptide and Amino Acid Matrix Designed to Closely Reflect the Nitrogen Components and Ratios Found in Human Mother's Milk (Micellar Alpha and Beta Caseins and Caseinates, Whey Concentrates Rich in Alpha-Lactalbumin, Whey Isolates, Whey Peptides, Purified Bovine Colostrum Extract Rich in Secretory IgA and IGF-1, Glutamine Peptides, L-Taurine, Lactoferrin). Leanlipids Trans Fat Free Lipid Complex Selected for Thermogenic and Unique Energy Properties (Canola Oil, Sunflower Oil, Enzyme Engineered Polyunsaturated Long-Chain Vegetable Oils, MCTs, L-Carnitine), Fructose, Maltodextrin, Cocoa Powder, Cytovite I, Vitamin and Mineral Premix Consisting of (Vitamin A Acetate, Cholecalciferol, D-Alpha-Tocopherol Acetate, Ascorbic Acid, Folate, Thiamine Monohydrate, Riboflavin, Niacinamide, Pyridoxine HCL, Cyanocobalamin, Biotin, Pantothenic Acid, Di-Calcium Phosphate, Potassium Iodide, Potassium Chloride, Ferrous Fumerate, Magnesium Oxide, Copper Gluconate, and Zinc Oxide), Creatine GCC, Our Proprietary, Endogenous Creatine Precursor (Glycocyamine, Betaine Anhydrous), Natural and Artificial Flavors, Acesulfame Potassium, Sucralose, Chromium Nicotinate. Take Muscle Milk anytime you would take in a shake or gainer, but want a better tasting, more anabolic formula. Mix two scoops in 10-12 oz water. Want even more satisfaction? Mix with low-fat milk. Tastes like a real milk shake. Honest! Before & During Workouts: For a truly awesome weight workout, take Cytomax and Muscle Milk together during the workout. Flooding the body with growth nutrients, plus the patented acid buffers of Cytomax, gives new meaning to burning down the house. After Workouts: After workouts, the body is in a catabolic state. 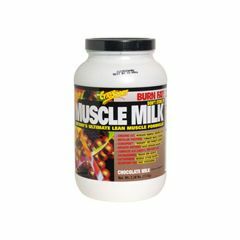 Muscle Milk helps reverse this muscle breakdown by tricking the body into muscle synthesis when you normally break down muscle. Prior to Bedtime: Sleep is actually a catabolic period. Remember, breakfast means to break your fast of the night. During any fast, you break down precious muscle tissue for energy. Muscle Milk will help you wake up more anabolic. IS THIS A GOOD PRODUCT FOR REGROWING SKIN TISSUE? SUCH AS BED SORES?